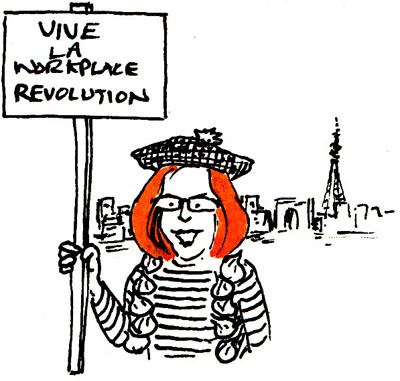 I’m writing a series of posts, under the collective title of Brave New World, which summarise ten patterns underpinning new ways of working and learning for complex contexts. The patterns, which I see recurring as times and contexts change, are themes linked to creating conditions for satisfying work and effective, customer-focused performance. Brave new world is the introductory post, Of patterns and progress is another introductory post that talks a bit about high-performance work systems, and Organise for customer focus was the first pattern to be tackled. The following two posts are Uncover value and Nurture informal networks. The themes are linked. I see one as (partly) an emergent property of the other. Let’s start with Uncover value. I will get around to explaining what I mean by Uncover value but I’d like first to talk about how value is created. Processes are the outcomes of what people do together. We both create and destroy value for the end customer and each other (in the service we give to each other as internal customers) through our relationships and interactions. That our relationships are the key to generating customer-focused value is crucial to appreciate. It’s interesting, to me at least, how we continue to get insight and moments of realisation, especially on topics we think we already know well. But I had a moment of profound realisation when re-reading one particular paper as I was preparing to write this post (I’ve read it many times). Back in 1997, Denison was reviewing how process perspectives of organisational design were evolving. He traces the progress of lean and quality approaches from an early focus on efficiency, elimination of waste for example, through to various methods for achieving agile, cost-effective customisation. This evolution was not new to me. It’s what he says about the implications for organisational design that hit me forcefully. As customers began to call the shots, attention shifted to the value creation process. The points of focus then became our flows of knowledge, relationships, interactions, and providing systems that enable us to work together within and across organisational boundaries. Now I’m not saying that control and co-ordination don’t matter, they do. These activities become integrated within value-creating processes, carried out by those doing the work. This of course opens up a whole other can of worms for what it implies for those whose roles need to shift from controlling to facilitating. What has happened in the eighteen years since Denison’s paper was published? Where to start? There’s the phenomenal explosion of personal connectivity enabled by cloud, mobile and social technologies. It’s not only customer power that’s potentially growing, its people beginning to choose how they experience work – both as employees and independent freelancers. They are electing to work from multiple places – cafés, on-the-go, co-working spaces – and demanding greater choice in how and when they work. The evolving picture is complicated, with winners and losers. Those whose skills are in short supply or who have specialist knowledge can increasingly work how they want, although interestingly there’s evidence emerging of counter trends. I know of several large companies who do not allow, or discourage, people from working away from the office because the knowledge they are co-creating is so complex that management wants them to be co-located. And then of course there’s the famous example of Marissa Meyer cracking down on Yahoo employees working from home. I said in Organise for customer focus there are a myriad of different ways businesses can decide who does what, how, when and with whom. That might now include working in alliances and partnerships with other companies for various reasons, outsourcing, and taking advantage of flexible working arrangements – varying time, place, and employment contracts, for example temporary contracts or using the services of freelance workers. Despite all this possibility for kaleidoscopic, flexible structuring for value-creation, I still think that too many businesses continue to be rigidly organised and managed for command and control. If we really are experiencing renewed customer power and extreme customisation (mass customisation started this ball rolling decades ago), businesses are going to have to learn quick-smart about value-creating business processes. The good news is that there’s a legacy of insight on which they can draw and build. We know from the past that when businesses were forced to transform their structures and working practices to confront disruptive threats and opportunities, everyone had to be involved – not just executive elites. And this inclusive expectation extended beyond the boundaries of one organisation and into networks of inter-connected component suppliers. But why do value-creating people and their networks have to be uncovered? He differentiated between high-performers and ‘walking overheads’, and noted that many companies put “enormous effort” into things that do not make a difference. He concluded that high-performers need to be identified, and to be able to get hold of the tools and support they need to do their jobs. I’m unhappy in labelling people, either as high-performers or walking overheads. How we perform depends not only on personal qualities but the context in which we find ourselves. Got a bully for a boss? You’re not likely to be firing on all cylinders. And what constitutes high performance anyway? Are there really common threads that make people more likely than not to be effective, assuming that performance environments, cultures and relationships with colleagues are supportive? So many questions. If we accept that we know what we are looking for, how do we go about discovering who knows what – and who knows who? Deliberately designing work so that everyone is encouraged – and expected – to participate in continuous improvement and innovation is one way, and this can be achieved in ways too numerous to address here. Another way is to design work so that people are held jointly responsible for outcomes (I gave a couple of examples in an earlier post in this series). This is where leaders are revealed – those who inspire, encourage, dare to do something new, and who encourage others to do the same. But constantly sensing, listening, engaging in conversations and asking our networks for recommendations are increasingly how we discover who knows what – and who knows who. Social technologies now have a crucial role to play in shining a light on who value-creating people are – and it might not be who you are expecting. It’s possible that their knowledge, skills and capabilities have been previously overlooked, as Coulson-Thomas suggests. Wishing you all a very happy, healthy and satisfying 2015.